A high-tech plaster could keep a constant check on your health, its makers have claimed. An tiny electronic device, which can be attached to an ordinary plaster, has been developed by a scientist from London's Imperial College. The device checks vital signs such as temperature, blood pressure and glucose levels, sending results to a computer, which highlights any cause for concern. Trials of the new technology should start in the next few months. The 'digital plaster' - which measures three millimetres by five - contains a silicon chip, which can carry sensors for a range of symptoms. 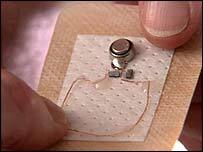 So a sensor could pick up the electrical activity of the heart to show if there were any problems. Other sensors would check signs such as temperature, or blood glucose levels. All this information would then be processed by the Sensium silicon chip which is powered by a tiny battery, the same size as that used to power a watch. The data can be sent from the device via a mobile phone or PDA (handheld computer) on to a computer database, which has been set up to detect results which are outside defined ranges. The developers say the patient themselves could be alerted if the results were worrying. The computer which is receiving the information could also be primed to detect a change in the pattern of results seen, which could then mean a doctor could be alerted to the problem. Toumaz, a spin-off company from Imperial College, which is developing the device, said it could even be used by people who want to keep a remote eye on an elderly relative. Keith Errey, chief executive of the company said: "You could include a motion sensor on there and it could act as a kind of 'granny monitor', so you would know if your relative had had a fall." He added: "What we have done is to make this device very small and need very little power." June Davison, a cardiac nurse at the British Heart Foundation said: "Telemedicine has the potential to greatly enhance patient care so that they can be diagnosed and treated locally, avoiding the need to travel long distances. "Telemedical devices to monitor heart health can be of particular use for those at high risk of arrhythmias or heart disease. "Telemedicine devices used in medicine vary widely in their complexity and sensitivity." But she said: "They still need thorough evaluation before they can be used widely." Ms Davidson added: "Despite the advantages of these new communication tools, nothing can replace the observation, diagnosis and reassurance of a medical practitioner, who should ideally oversee any monitoring of the patient's condition."